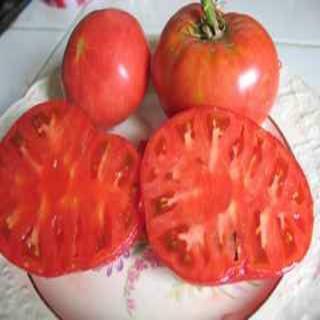 Large, ponderous vines set out "amazing" amounts of gorgeous purplish pink, medium to large beefsteak tomatoes. Another great one from Darrell Merrell. Heirloom Seed Packet. Large, ponderous vines set out "amazing" amounts of gorgeous purplish pink, medium to large beefsteaks. Bugs nor disease can stop this one! When you think you've picked the last of them, go look again! Tickle your taste buds. This is truly one of the best tasting pink tomatoes in the world. Another great one from Darrell Merrell.